You knew it would come eventually, right? HTC wasn’t just going to stop with smartphones that were equipped with Beats by Dre technology, they had to bring it to tablets too. In an interview with the press yesterday to discuss their new line of headphones, Beats gurus Jimmy Iovine and Dr. Dre spoke on the importance of pairing their products with tablets. The weird thing here was listening to Jimmy talk about “the heads of the company that makes that thing” when referring to, what we are assuming is HTC and their tablets. He would not for whatever reason, mention them by name. Sounds like he’s really invested in this partnership, eh? 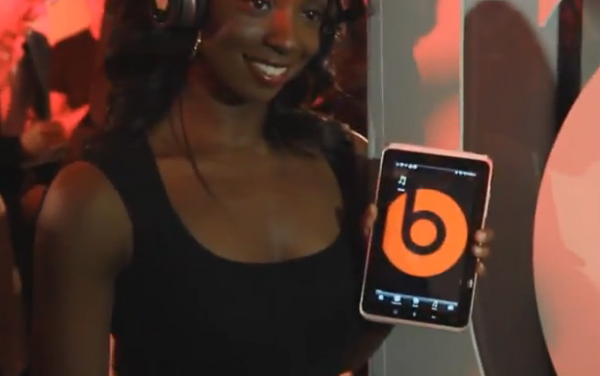 During the video we have attached below though, you will see a ton of shots of the HTC Flyer with a massive beats logo on it as well as it paired with some of their new wireless headphones. When you purchase the soon-to-be-announced HTC devices that come Beats-equipped, these are the headphones you will likely see. During years of testing, they finally found a way to make sound over Bluetooth live up to their standards. We know that many of you are not the hugest fans of Beats headphones, but as long as prices of devices aren’t skyrocketing with a pair included, I would hope that you would all welcome them over those stock garbage ear buds that we have seen in the past.